Natural catastrophes are a key risk in our Property & Casualty (P&C) business. The damage caused by floods, storms, earthquakes and other natural catastrophes can affect millions of lives and the economies of entire countries. With hurricanes Harvey, Irma and Maria as well as other major catastrophes, the year of 2017 was the costliest ever. Total worldwide economic losses from natural and man-made catastrophes were over USD 337 billion – of these, approximately USD 144 billion were insured. Over the whole year, Swiss Re’s combined estimated claims from large natural catastrophes amounted to USD 4.7 billion. These figures underline the significant benefits that access to effective re/insurance protection against natural catastrophes creates for our clients and for society at large. 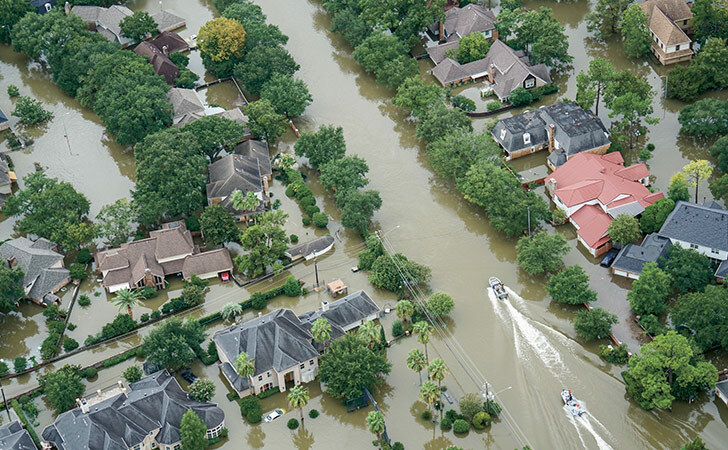 In 2017, our clients in P&C Reinsurance paid us USD 2.3 billion of natural catastrophe premiums (for losses larger than USD 20 million), equivalent to approximately 14% of total premiums in this business segment. Even before 2017, both economic and insured losses caused by natural catastrophes had steadily increased on average over the past 20 years. The key reasons are economic development, population growth, urbanisation and a higher concentration of assets in exposed areas. A residential area of Houston, TX flooded by Hurricane Harvey. The 2017 North Atlantic hurricane season was the second costliest ever, underlining the importance of understanding natural catastrophe and climate risks. This general trend will continue. But crucially, economic losses will be further aggravated by climate change. The scientific consensus is that a continued rise in average global temperatures will have a significant effect on weather-related natural catastrophes. According to the Special Report on Extremes (SREX, 2012) and the Fifth Assessment Report (AR5, 2014), published by the Intergovernmental Panel on Climate Change (IPCC, www.ipcc.ch), a changing climate gradually leads to shifts in the frequency, intensity, spatial extent, duration and timing of extreme weather events. If climate change remains unchecked, the makeup of the main drivers will thus gradually shift, with climate change accounting for an increasingly large share of natural catastrophe losses. To assess our Property & Casualty business accurately and to structure sound risk transfer solutions, we need to clearly understand the economic impact of natural catastrophes and the effect of climate change. This is why we invest in proprietary, state-of-the-art natural catastrophe models and regularly collaborate with universities and scientific institutions. While the impact of climate change will increase gradually over the coming decades, most of our business is renewed and repriced annually, and our risk models are refined every few years. Risks are normally covered for 12 months (up to five years for cat bonds). Thus, re/insurance premiums do not reflect expected loss trends over the coming decades. Rather, for underwriting and risk management purposes, our models provide an estimate of the current risk. But as natural catastrophe losses continue to rise as a result of the different factors described above, our models will gradually factor in this trend. In addition to providing re/insurance covers, we offer our clients strategic expertise and integral risk assessments of natural disasters and climate adaptation. These include our Economics of Climate Adaptation (ECA) studies, free access for our clients to Swiss Re’s CatNet® tool and our expertise publications. You can learn more about the CatNet® tool at www.swissre.com/catnet and view a sample of our recent publications. In 2017, we agreed to conduct an ECA study for the city of Lishui in China as part of our cooperation with the Deutsche Gesellschaft für Internationale Zusammenarbeit (see Strengthening risk resilience in Lishui, China). In our 2017 Financial Report, we provide detailed quantitative information on natural catastrophe perils: the four perils with the highest expected annual losses (TCFD Metrics and targets) and the liquidity requirements stemming from four extreme loss scenarios (“insurance risk stress tests”).